With nearly 200 breweries spread across the city and its surrounding areas, Chicago is truly a beer mecca with something for everyone. But there’s more to the Windy City’s brewery scene than just beer: Plenty of them pay just as much attention to the bites they offer as they do to what’s on tap. This tried-and-true brewpub is an especially great place for gourmet bar snacks, like their made-from-scratch house pretzel and perfectly decadent bacon fat popcorn. 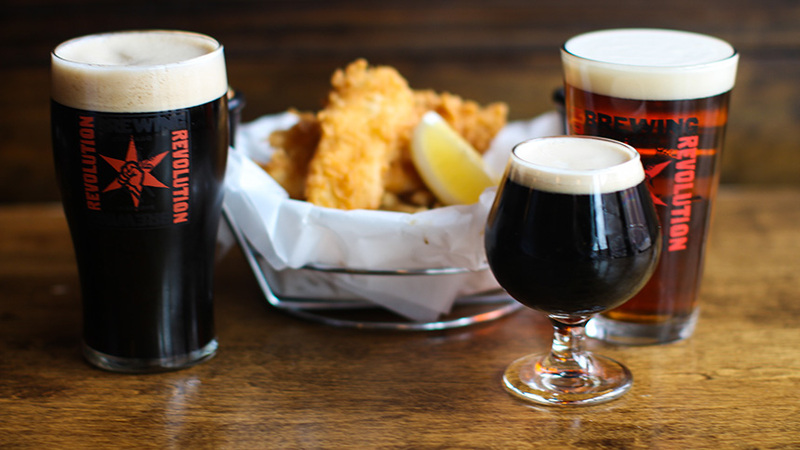 Or, dive into their Fist City Fish & Chips, which incorporates Revolution’s uber-popular pale ale. With warm weather on the horizon, swing by for their Sun Crusher launch on March 27th, celebrating the first days of spring by bringing hoppy wheat ale back on tap for the season. Don’t be fooled by the fact that there are only a few items on Moody Tongue’s menu — your palate will be more than pleased here. In addition to selections of cheese and sausages, this stunning tasting room is known for serving up oysters and one of the most memorable pieces of cake you’ll ever have. The 12-layer chocolate symphony is truly next-level, combining espresso cheesecake, german chocolate cake, ganache, buttercream, and more. 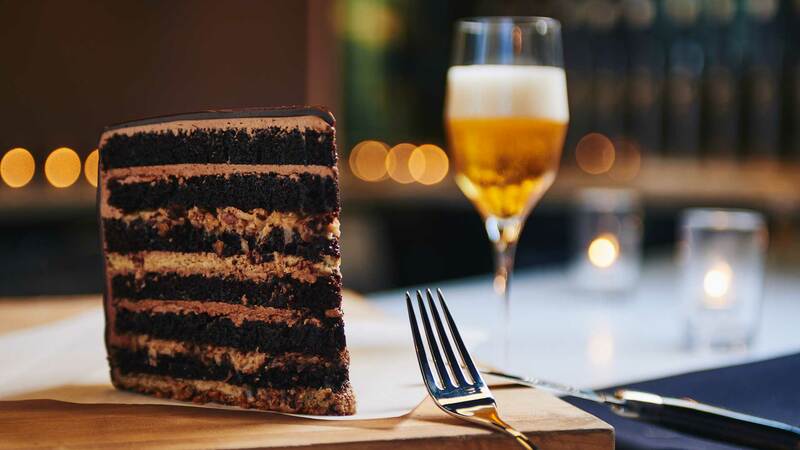 Email them ahead of time to schedule a beer and cake pairing experience, coupled with a private brewery tour (starting at $38). You’ll sample their signature sweet with some of their creative concoctions, such as a Caramelized Chocolate Churro Baltic Porter or Bourbon Barrel Aged Gingerbread Imperial Stout. A Michelin-starred brewpub? Yes, it exists — and it’s as good as you’d imagine. 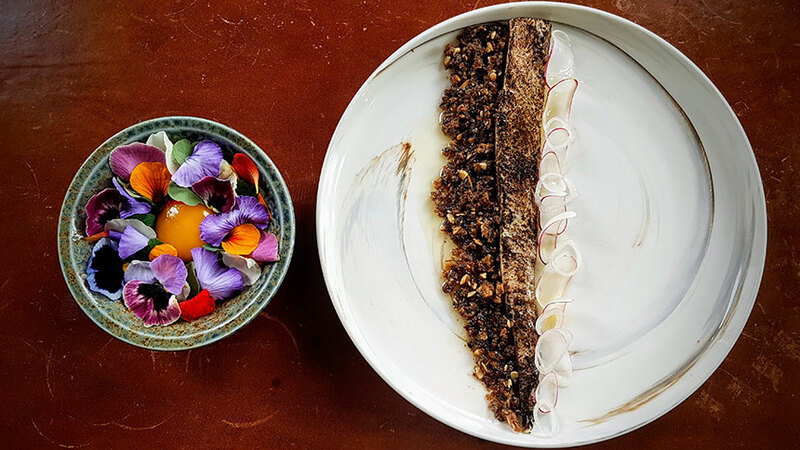 This self-described “culinary brewhouse” serves up dishes such as pan-fried monkfish with smoked trout roe and mussel crème alongside their flagship Noble Raven Ale. Decisions may be hard to make here, so the tasting menu with added beer pairings (starting at $81) is a wise choice. When you sit down at a brewery owned by Rick Bayless, fantastic food is to be expected. Inspired by one of Oaxaca’s most famous markets, this housemade tortilla emporium celebrates wood-grilled meat alongside small-batch beers. Tacos are always a great idea, but the tlayudas, giant Oaxacan tostadas, are a tasty way to commemorate your visit. Lagers, IPAs, and sours flow freely, but a refreshing Michelada (using Mexico Calling Lager Especial, Bloody María mix, and lime juice) is hard to pass up. 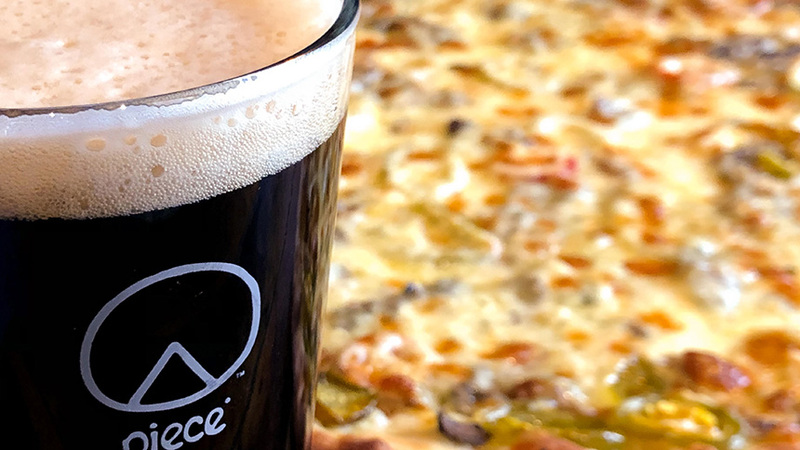 You’d want to go to Piece for the amazing pizza alone, but the fact that their beers are just as delicious — it’s Chicago’s most award-winning brewpub — is a wonderful treat. Feel free to get a little outside of your comfort zone (yes, you do want mashed potatoes or clams on your New Haven-style pizza), or order one of Piece’s collaborative creations with other popular Chicago restaurants, such as pies designed by Honey Butter Fried Chicken, Hot Doug’s, and Lillie’s Q. Known for their “botanic beers” inspired by nature, this spot has some of the most flavorful brews in town (choose from a Strawberry Basil Hefeweizen, a Wildflower Pale Ale, and more). Their array of fresh ingredients is also evident throughout their food menu, which is just as tasty (when in doubt, go for the milk-brined pork schnitzel sandwich). While its menu items are consistently raved about, Forbidden Root won’t rest on its laurels — there’s a steady rotation of new dishes to try. Keep an eye out for special events that keep the creativity coming, such as the five-course “Jamon y Bacalhau” Portuguese Beer Pairing Dinner on March 20th.